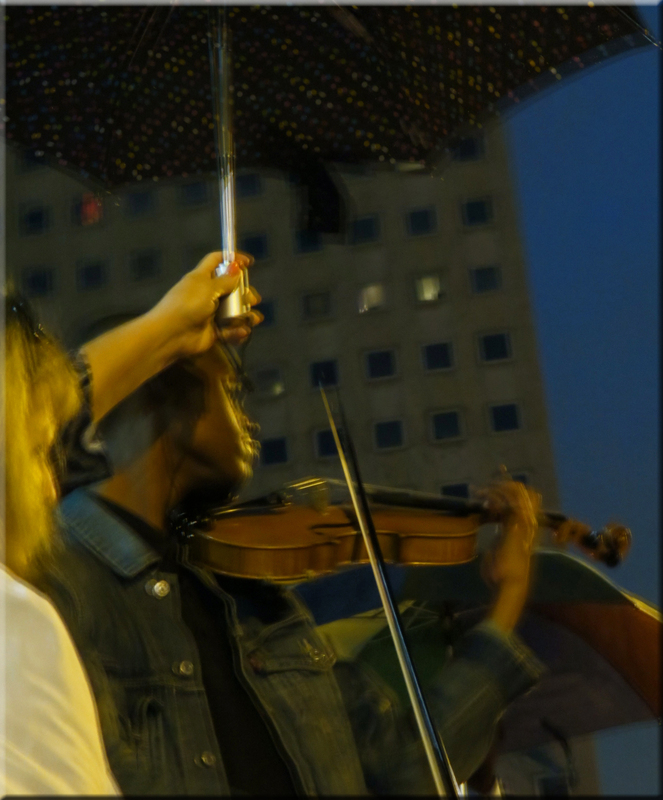 Betsey Piette carries picture of Laporshia. 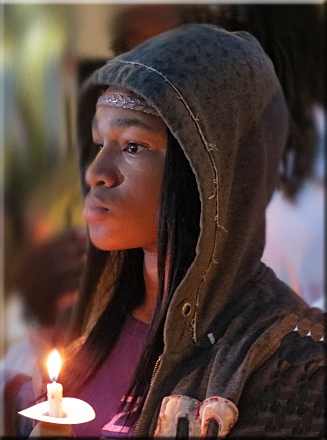 Just 17 months later, the nurses organized a candlelight vigil for Laporshia Massey, who arrived home from her school, Bryant Elementary, suffering from an asthma attack and dying later that evening at Children’s Hospital. Laporshia fell ill during school the day, reportedly complaining of difficulty breathing. At that time, no nurse had been on duty at the school. 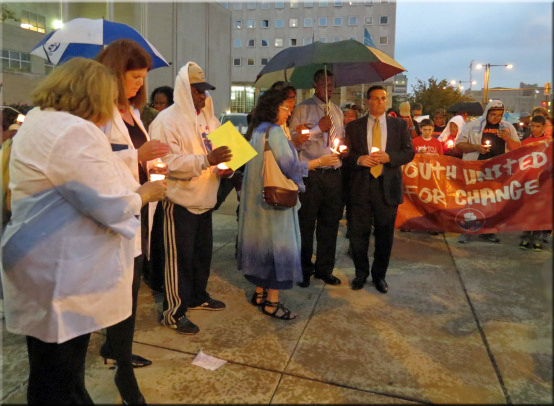 Laporshia’s father, Daniel Burch (holding umbrella) stands with school nurses, who organized the vigil. The district spends more than ten times the national average serving its debt, with an astonishing $280 million—12 percent of its entire budget—going to interest payments and $161 million going to Wall Street firms in what have been called “toxic” interest rate swaps, under criticism in other cities for unjustly robbing schools of resources. 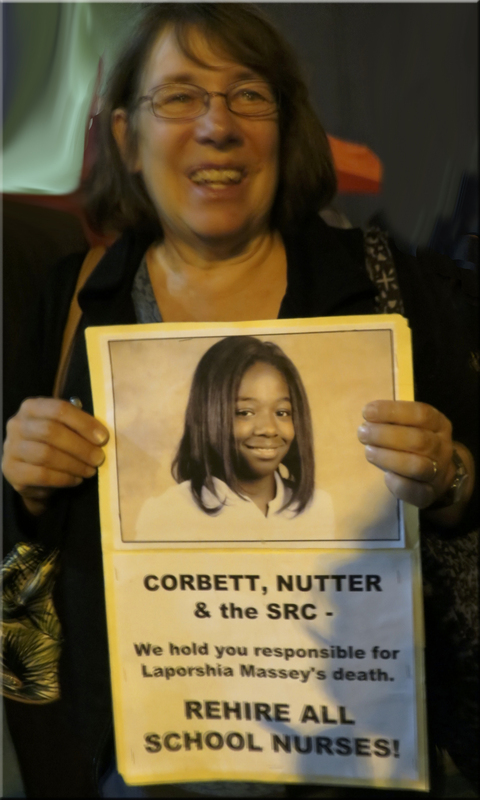 Ironically, a day before the candlelight vigil for Laporshia, the district learned that Philadelphia will receive the $45 million in federal funds that Corbett had been withholding. A spokesman for Corbett stated that the release of the funds and Laporshia’s death were not connected. Philadelphia school superintendent, William Hite, stated he did not plan to rehire any nurses because the district has “met the state’s caseload standard.” Are parents left wondering whether there will be another time the school nurses will be holding candles outside the 440 Building? Bryant Elementary School is located at the corners of Cedar Avenue and 60th Street in West Philadelphia. Playground equipment stands securely on one corner of the school lot, and along the walls of the brick building, colorful murals illustrate scenes of children swinging, dancing and jumping rope. While economists, bureaucrats and government officials argue the merits austerity measures, one mural might be different now. Right, and these crises affect so many people yet most news media gloss over the significance of these cuts. What is so maddening is how the Philadelphia schools are strapped by that debt. This is a travesty! Schools in Western Australia were indeed fortunate to have teachers’ assistants hired specifically to supervise very at-risk children. Of course, funding for that has recently been cut. I don’t know how teachers are coping. Yes, these austerity cuts hurt the most vulnerable, and in the long run society suffers. There always seems to be money for those who keep the politicians in office. Thanks for commenting.